The online version of this article (doi: 10.1007/s10584-013-0931-0) contains supplementary material, which is available to authorized users. Use of sub-global future socioeconomic scenarios with context-specific, bottom-up processes that may be disconnected from global scale processes, limiting opportunities for comparison across studies and reducing the usefulness of the results for decision makers (Hallegatte et al. 2011; Kriegler et al. 2012; Ribot 1995). Methods to develop scenarios are sometimes ad-hoc and diverse (Preston et al. 2011). A recent initiative to develop a new set of global socioeconomic scenarios to serve different areas of climate change research using a matrix architecture including Shared Socioeconomic Pathways (SSPs) and Representative Concentration Pathways (RCPs) (Ebi et al. this issue; Kriegler et al. this issue; O’Neill et al. this issue; van Vuuren et al. 2011, this issue) may offer new opportunities to increase coherence between scenarios at different scales and expand their use in IAV studies. This broadening analytical frame should, in turn, provide fresh insights into how future socioeconomic conditions may determine the magnitude and extent of potential climate change risks as well as society’s ability to adapt. RCPs characterize varying levels of greenhouse gas and aerosol concentrations in the atmosphere as well as changes in land use that can affect the global climate during the 21st century and beyond (van Vuuren et al. 2011) and are being used as inputs to climate models in the Climate Model Intercomparison Project (CMIP5—Taylor et al. 2011). A framework for constructing scenarios using SSPs and RCPs is described in this issue (Kriegler et al. this issue; O’Neill et al. this issue; van Vuuren et al. this issue) and narrative descriptions of five SSPs have been drafted (O’Neill et al. forthcoming). Quantification of several SSP elements is underway using Integrated Assessment Models (IAMs). Some of the key drivers of social, economic, and environmental change, such as population and gross domestic product (GDP) are globally specified on the country-level. The development of SSPs is proceeding in two stages, with a “basic” set of SSPs being developed that include broad-scale narratives and global quantifications. This high-level set of global SSPs establishes a platform for developing “extended” SSPs that include substantive elaborations for specific sectors and regions. The matrix architecture of combining SSPs with RCPs into new scenarios allows IAV researchers to ask questions such as: “what could be the impacts of a given amount of climate change in worlds characterized by different development pathways?” (i.e. combining a single RCP with multiple SSPs), or “what could be the impacts of different levels of climate change under one possible future world?” (i.e. combining a single SSP with multiple RCPs). The unpacking of the scenarios into climate, development pathway, and policy provides researchers with a tool kit for asking more policy relevant questions than were possible with earlier scenario sets. The process of new scenario development offers new opportunities for advancing the use of scenarios in IAV studies (see e.g. Rothman et al. this issue; Wilbanks and Ebi this issue). The process could be enhanced by addressing the question of how to bridge the scales between the global and the regional, local, and sectoral interests of the IAV community. The literature provides numerous and diverse examples of approaches for bridging across scales, but such methods can introduce further uncertainties and raise questions of internal consistency. Also, earlier global scenario sets lack a number of elements of socioeconomic development relevant to IAV analyses including trajectories of key indicators to characterize vulnerability and adaptive capacity. In this paper, we explore how the SSPs and new scenarios can be made more useful to IAV researchers. What methods exist to extend the SSPs across multiple scales, and how can the SSPs increase coherence among studies with a strong bottom-up component? What elements and variables have IAV researchers added to global scenarios in the past, in order to be able to use them in IAV analyses? We aim to find a pragmatic compromise between generating as many indicators and variables as possible, whilst also recognising that only a limited number of variables can be meaningfully projected. Section 2 discusses the main uses of socioeconomic scenarios in IAV analyses and details the elements and indicators needed for such studies. Section 3 presents an overview of the use of global environmental scenarios during the past decade for IAV studies and identifies shortcomings of those scenarios for IAV applications. Section 4 discusses methods for working across scales, and presents a rationale and procedures for adding additional elements to the SSPs. Finally, Section 5 surveys some of the remaining challenges and offers concluding remarks. Socioeconomic scenarios have varied uses in impacts, adaptation, or vulnerability studies, each application placing different demands on the types of scenario information required (Carter et al. 2001, 2007). Impact studies analyze the impacts and risks of climate changes for human and natural systems, with the aim to estimate the character, magnitude and rate of impacts across a number of contrasting scenarios and to investigate the effectiveness of various mitigation or adaptation measures in reducing risks or exploiting opportunities. In these studies, socioeconomic development pathways are generally used to characterise future exposure to climate changes. Studies focusing on adaptation require scenarios that characterise the conditions, incentives or barriers that affect adaptation options and adaptive capacity. Here, different socioeconomic scenarios can be combined with different climate scenarios to estimate the effectiveness of adaptation, residual damages after mitigation and adaptation, and the associated costs. In research on vulnerability, scenarios can be used to enhance understanding of the key factors predisposing systems and communities to potential adverse impacts of climate change, exploring how causal relations between those factors might develop or change in the future. Key questions for vulnerability and adaptation studies include “adaptation to what?”, “who or what adapts?”, “how does adaptation occur?”, “have objectives been achieved?” (Funfgeld and McEvoy 2011; Preston and Stafford-Smith 2009; Smith et al. 2000). Each of these questions is dependent upon socioeconomic futures. More discussion on the role of vulnerability assessment and an explicit discussion of the (lack of) use of socioeconomic scenarios in IAV research and the potential consequences of that can be found in Preston et al. (2011). The applications of scenarios for IAV studies pose high demands on socioeconomic scenarios in terms of delivering specific information at the scale of analysis and for the number of variables required to describe future vulnerability and adaptive capacity. The selection of appropriate variables to describe the different dimensions of vulnerability and adaptive capacity is still under discussion. Factors describing vulnerability are often highly context specific, and one formidable challenge is to translate these into general variables that can be flexibly applied across different contexts. Further difficulty is introduced in attempting to quantify factors that are inherently qualitative, such as the quality of governance or levels of participation in decision-making. Several new vulnerability indices have recently been developed, such as the indicators for susceptibility, coping capacity and adaptive capacity in the World Risk Index (WRI) (Birkmann et al. 2011) and the Global Adaptation Index (GAIN: Global Adaptation Institute 2011) (see Table 1). In this regard it is important to note that some of these risk, vulnerability and adaptation index approaches use various indicators that are also applied in the SSPs and global impact models, hence it would be possible to explore more intensively the usefulness of scenarios in these vulnerability and risk assessments (see Birkmann et al. 2013). Nevertheless, the above challenges remain relevant and the utility and legitimacy of such indices is still contentious (Barnett et al. 2008; Hinkel 2011). Over the past decade, several global scenario sets for global environmental assessments were developed (van Vuuren et al. 2012a) such as the IPCC SRES (Nakicenovic et al. 2000), the Global Environmental Outlook scenarios (GEO) (UNEP 2002, 2007) and the Millennium Ecosystem Assessment (Carpenter et al. 2005). The Special Report on Emissions Scenarios (SRES) presented scenarios of greenhouse gas emissions for mitigation research, consisting of simple storylines and model quantifications. The four global and seven regional GEO scenarios have a broader scope, characterising drivers of global environmental change and explicitly including indicators related to poverty, educational attainment, and malnutrition, as well as discussing progress on achieving the Millennium Development Goals (MDGs). The design of the Millennium Ecosystem Assessment (MA) scenarios was similar to that of SRES, but with a focus on ecosystems and human well-being rather than on climate change. An innovative aspect of the MA-scenarios was the multi-scale design. Besides global scenarios, much effort was directed to 35 sub-global assessments linking across scales. This resulted in a large body of empirical evidence and methodological findings of how to develop multi-scale scenarios (Zurek and Henrichs 2007). The results of the MA spurred thinking on the role of global scenarios in sub-global studies. In practice, these global scenarios—at least in their original form—had limited application to IAV analyses (Arnell et al. 2004; Kriegler et al. 2012) because the storylines, assumptions, and model outputs were elaborated at different scales than those needed for most IAV studies. The GEO and MA scenario exercises were partly designed to overcome this limitation by nesting global and regional scenarios. However, as these exercises did not use climate model runs, there are only a few applications in IAV studies (e.g. Kok et al. 2011). For the SRES, climate runs based on emissions and land use are available, but offer only limited elaboration of socioeconomic variables and regional information. However, the storylines offer a guide for additional assumptions for climate impact and mitigation analyses (Nakicenovic et al. 2000); examples include institutions and governance (Berkhout et al. 2002), land use (Rounsevell et al. 2006), income distribution and poverty (Calzadilla 2010), and regional exercises (Carter et al. 2004; Holman et al. 2005). However, although many IAV studies use SRES-based climate projections, only a few studies use socioeconomic projections, mostly limited to downscaled projections of population and GDP (Carter et al. 2007). The first set of these downscaled SRES projections was published by Gaffin et al. (2004) using simple techniques. More refined methods of downscaling were published later. One of these accounts for partial convergence in per capita GDP within world regions based on the SRES storylines (van Vuuren et al. 2007). Another distinguishes urban and rural areas in population and GDP projections and adds a geographic gravity model framework (see Section 4.2.2) to represent urban spatial expansion more effectively (Grübler et al. 2007). IAV studies that used these downscaled projections for population and GDP also sometimes included additional elements; examples include studies of water availability and flooding that used assumptions about development indicators and sectoral scenarios (Döll 2009; Hinkel et al. 2012; Nicholls 2004; Pérez Urrestarazu et al. 2010). Studies of agricultural impacts made additional assumptions about food demand, trade, yields, and other sectoral information (Parry et al. 2004; Verburg et al. 2008; Wu et al. 2011). Ecosystem impact studies made additional assumptions about technology and deforestation (Golding and Betts 2008; Metzger et al. 2008). Population and health studies have used downscaled population (McCarthy et al. 2010) combined with expert judgment on adaptive capacity instead of using the socioeconomic assumptions in the SRES (van Lieshout et al. 2004). Overall, studies that use the SRES tend to focus more on impacts than on vulnerability or adaptive capacity, possibly because of the paucity of relevant variables. Fast-track IAV studies using the SRES (Arnell et al. 2004) reported a lack of sophisticated downscaling (including for narratives), although this issue was improved by later methods development (Grübler et al. 2007; van Vuuren et al. 2007) and the MA and GEO exercises. The SRES (in particular) lacked detailed references to many of the key factors responsible for shaping vulnerability and adaptive capacity, including multi-dimensional, sub-national aspects of development and non-quantifiable aspects of institutional change or governance. As described above, individual studies made assumptions about such indicators and elements, although ad hoc procedures inevitably introduced inconsistencies between studies. The deterministic nature of many scenario efforts. Where climate models produce ensembles of projections, socioeconomic models project a single future per scenario, inherently reducing the representation of uncertainty (Arnell et al. 2004; Carter et al. 2001). Global scenarios are not necessarily developed to explore the full variation in factors relevant to IAV research, such as adaptive capacity in future worlds. For example, an extension of the income projections found in the SRES scenarios might plausibly have included variants that fixed or even decreased regional income, offering a wider range of potential impact outcomes (Arnell et al. 2004). Table 1 describes variables and indicators from several global scenario sets, those added to the SRES scenarios in individual IAV studies for different sectors, and those included in two vulnerability indices (WRI and GAIN, see Section 2). There is considerable overlap in variables and indicators of vulnerability between the scenario sets and the indices. The dominant variables in the vulnerability indices are income/poverty, education, spatial population, population structure, health/life expectancy, infrastructure, and governance/resource management. Some of these variables are included traditionally in global scenario sets, such as GDP per capita, while others are extensions of traditional variables, such as education, dependency ratios, and life expectancy; the latter are included in the extended set of population projections for the SSPs (Lutz et al. 2013). Some elements, such as infrastructure, are available from IAM models (see e.g. Pachauri et al. 2013; Sassi et al. 2010). There are methods available to develop projections for other elements, such as poverty/income distribution, spatial population, health and governance, and a research agenda for pursuing this is presented in Section 4.2. The SSPs, and the new scenarios based on SSPs and RCPs provide an opportunity to reduce several of the limitations identified above for the use of scenarios in IAV work, including benefiting from lessons learnt in the MA and GEO exercises to improve applicability and coherence across scales. The SSPs and new scenarios can also include a richer set of elements more useful to projections of vulnerability and adaptive capacity. Below, we elaborate on efforts to improve working across scales and to developing a richer set of elements. Spatio-temporal scale differences are an important challenge and hindrances to producing socioeconomic scenarios useful for IAV-research (Kriegler et al. 2012). More detailed spatial resolution is particularly relevant for local or regional IAV-studies, particularly those focusing on shorter time horizons (e.g. two decades). Several top-down or bottom-up methods exist to reconcile global scenarios can with local, regional, or sectoral IAV studies. Top-down methods would use the global SSPs as socioeconomic boundary conditions for downscaling. Such downscaling can be qualitative through developing narratives that represent regional or sector-specific storylines nested in, and therefore internally consistent with, the global pathways (e.g. Holman et al. 2005; Kok et al. 2011; Sleeter et al. 2012). Investment in developing qualitative storylines for regions or sectors offers flexibility for incorporating regional and/or sectoral knowledge and preferences to enhance the relevance of the storylines for such applications. For some applications, qualitative information may be sufficient to achieve study objectives (Rounsevell and Metzger 2010). Narrative downscaling is often a procedural step when developing downscaled quantitative scenarios (van Vuuren et al. 2010). Having established the regional, local, and/or sectoral context to describe a set of alternative futures, those qualitative futures can be translated into quantitative indicators to facilitate subsequent analyses. Although there is no shortage of conceptual approaches, no standardized methods exist to facilitate that translation, making the process somewhat ad hoc and subject to the needs of individual studies and normative assumptions. By building on the experience with the SRES scenarios (Grübler et al. 2007; van Vuuren et al. 2007), various statistical and model-based downscaling methods can be applied, assuming some a priori, coarse-scale quantitative metrics to generate regionalized quantitative scenarios for relevant assessment indicators (van Vuuren et al. 2010). Although expedient, such approaches often develop scenarios for a limited suite of variables with little consideration of the broader socioeconomic context. Although there are numerous examples of how global storylines and scenarios can be downscaled for regional/sectoral IAV applications, much IAV research and assessment proceeds bottom up. Therefore, there may be less demand among IAV researchers and practitioners for global scenarios as explicit boundary conditions, particularly when local trajectories and/or visions of the future appear disconnected from global-scale processes. While bottom-up approaches are likely to continue, mechanisms for constructing ex post links to the global scenarios would prove useful for collating diverse storylines and scenarios across scales to enable some degree of comparison (see e.g. Sietz et al. 2011). Those developing regional/sectoral storylines and scenarios should be encouraged to review those futures in the context of the global scenarios and, to the extent possible, map the former to the latter. Concepts such as sociotechnical imaginaries (Jasanoff and Kim 2009) can be helpful for linking local, regional and global scenarios. Such cross-scale mapping provides significant flexibility to the IAV community with respect to storyline/scenario development while still enabling a qualitative link to global scale socioeconomic processes. Obviously, there are challenges that arise when working with scenarios across scales. Interactions between the local and the global level can transform local conditions in ways that matter very much for adaptation decisions at that scale, but where it has little impact at broader scales. In such circumstances, to force a global storyline on those local processes would be counterproductive. This issue is not limited to climate change and occurs in many situations of multi-level decision making. On the other hand, there are global factors often not considered in local and regional scale scenarios, such as trade and markets, that can have significant effects on projected impacts. Section 3 identified a number of indicators of interest to enhance the value of SSPs and new scenarios for IAV research. Adding projections of sub-national income distribution, spatial population, health, and governance would assist many IAV research projects in connecting to the global scenarios. In a way, this provides a prioritization of quantifying SSP elements as mentioned in O’Neill et al. (this issue) for IAV applications, although other researchers, policy-makers, and groups may suggest additional variables. Adaptation studies take place at scales from national to household, with inequalities at each scale. Indicators that capture sub-national inequalities are important to guide location-based assessments of vulnerability and impact differentials. Past efforts to assess impacts locally have often had to rely on downscaling methods (Grübler et al. 2007; van Vuuren et al. 2007). In response to growing demand by the IAV community for sub-national indicators, the SSPs aim to include quantitative projections of within-country income inequality and educational attainment. Literature on drivers of income inequalities stress the importance of structural and demographic change; physical and human capital accumulation; global trade and financial market integration and liberalization; technological progress; and policy and institutional factors (OECD 2011). In contrast to some scenarios of global income inequality (Calzadilla 2010; Hillebrand 2008) that assumed within-country income distributions do not change, the SSPs will construct trajectories of within-country income inequality. These quantitative projections of income inequality could be based on multiple methods and models, and could incorporate relevant drivers to varying degrees. Possible approaches include aggregate inequality measures at national scale based on social and institutional factors (Kemp-Benedict 2011), a parametric approach focusing on education differentials, a macroeconomic simulation (Hughes et al. 2009), and global macro-economic models combined with micro-simulation (Busselo et al. 2010). Given the importance of multiple scales in IAV analysis, decomposable inequality indicators, such as the Theil index (Theil 1972), are preferable to non-decomposable or partially-decomposable indices like the Gini coefficient. Spatial population projections are highly relevant for IAV analyses, where the location of people is one factor determining climate change risk (see e.g. Balk et al. 2012). Although there is lack of coherence between present-day datasets (Seto et al. 2011; Zhang and Seto 2011) and many different approaches exist (Angel et al. 2011), recent methods strengthened the connection between qualitative storylines and projected population outcomes. In contrast to earlier methods based on trend extrapolation and/or proportional scaling techniques, newer methods based on geographic gravity models can be calibrated to reflect spatial patterns of change in the historical data (Jones 2012). Furthermore, these models can be adjusted to reflect varying assumptions regarding the socioeconomic conditions that may impact future spatial patterns of development. Recent models project the urban/rural components of population and separately replicate urban and rural population dynamics. Additional improvements include improved spatial resolution, inclusion of geophysical spatial data (e.g., elevation, slope, surface water, and protected land) to better model habitable land, and exploration of the relationship between national socioeconomic indicators and sub-national population distribution (e.g. Nam and Reilly 2013). Projections of access to public health and health care services and burdens of diseases are relevant for vulnerability and adaptation assessments (McCarthy et al. 2010; van Lieshout et al. 2004). The SSPs could be enriched with projections based on methods such as the WHO global burden of disease (GBD) approach and the methods included in models, such as GISMO and International Futures (IFs). The GBD approach uses linear regression of mortality with GDP per capita, human capital, technological change and tobacco use for major disease clusters (Mathers and Loncar 2006). This approach makes no specific assumptions about the relationships between more distal socioeconomic factors and more proximate determinants of morbidity and mortality, such as environment, lifestyle, and physiological risk factors. The GISMO (Hilderink and Lucas 2008) and IFs (Hughes et al. 2011) models complement the GBD approach to address some of these issues. Both models include approaches to simulate the health system and to address morbidity and mortality as a result of exposure to distal and proximate socioeconomic and environmental health risks. Elaborating on governance is crucial to application of the SSPs and new scenarios for IAV research. The current SSP narratives include only a basic description of governance at the international and national level (O’Neill et al. forthcoming). It is difficult to include governance dimensions in global integrated assessment models, although several attempts exist (e.g. Hughes et al. 2013). For global scenario-analysis, it seems more fruitful to have different governance parameters influencing model input parameters rather than including these in the models (de Vos et al. 2013). A key-issue for elaborating governance is not only to find quantitative indicators for governance itself, but also to elaborate on how different scientific perspectives on governance and potential future development in governance scenarios play out in terms of quantitative indicators for development, vulnerability, and adaptive capacity. Based on the Earth System Governance project (Biermann et al. 2009) and the SSPs could provide more elaborate descriptions of governance that reflect recent trends in governance thinking, from government focused to distinguishing multi-actor, multi-level governance. The SSPs and new scenarios will be crucial for improved projections and assessments of climate change risks and options for their management. They can improve coherence in the growing body of regional scenario studies, provide global boundary conditions to frame regional studies and inform large-scale impact, adaptation and vulnerability assessments. Strategies to reduce vulnerability and increase adaptive capacities of societies facing climate change risks have to account for a variety of potential changes in societal conditions. The usefulness of the SSPs and new scenarios would be enhanced for IAV researchers by adding a richer set of elements to the projections—including income distribution, spatial population, human health, and governance—and by improving scenario application across spatial and temporal scales. This paper suggests a research agenda to start this process. As part of the broader ‘parallel’ scenario process (Moss et al. 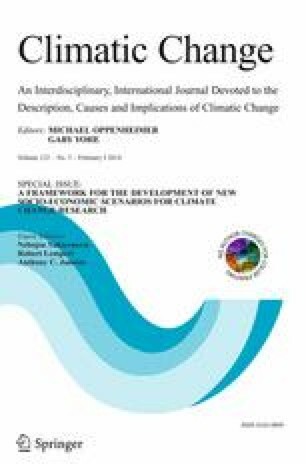 2010), the scenarios provide a range of new opportunities for integrating alternative socioeconomic and climatic futures for the purposes of local, regional, or sectoral impact analyses and for evaluating possible adaptation and mitigation policies (van Vuuren et al. 2012b). In contrast to the SRES storylines and scenarios, the matrix architecture of the new scenarios allows greater flexibility in exploring combinations of socioeconomic and climate futures from multiple alternatives. For regional/sectoral applications, climate projections based on the RCPs may need to be downscaled to generate climate information at the scales relevant for particular IAV applications. The IAV community is sensitive to uncertainty in model projections for a given RCP and thus often uses multi-model ensembles to explore the uncertainty space associated with different model realizations of the future climate. A similar approach might be desired in using multiple socioeconomic models (or IAMs) for each SSP. One of the remaining challenges is how to balance the need for producing long-term averaged/smoothed scenarios of socioeconomic development with the interest to remain sensitive to crises and shocks at local/regional and decadal scales. The latter are of great importance for the vulnerability and impact context as they might trigger long-term—positive or negative—changes in terms of vulnerability and adaptive capacity (Birkmann et al. 2010). One possible way forward would be to integrate the possibility for medium scale fluctuations—e.g. economic crises or a major pandemic—into the scenarios and to assess whether and how such events might alter the speed and direction of the larger pathway. Such amendments can provide important and policy-relevant bridges and insights. We here use adaptive capacity to refer to the combination of all the strengths, attributes, and resources available to an individual, community, society, or organization that can be used to adapt to a changing climate change (IPCC 2012). Vulnerability is a contested term in the literature (Hinkel 2011; Preston et al. 2011; Rothman et al. this issue). We here use the definition of the IPCC SREX, which defines vulnerability generically as the propensity or predisposition to be adversely affected (IPCC 2012).